More specifically, Magic Kingdom! You might think that restaurants are the only way to sample all of this park’s different offerings, but don’t forget about the SNACKS! There are so many neat unique-to-Disney snacks to be had all over Magic Kingdom. This round up will get your taste buds piqued. Leave your diet at the gate and see how many different snacks YOU can discover! 1. Mickey Premium Ice Cream Bars – Not much explanation needed for this one, right? Rich milk chocolate that generously coats creamy vanilla ice cream, on a stick. Scrumptious! Find these treats from one of the many cart vendors in the park who sell frozen novelties. 2. Cake Cups – I had the chance to stop by the Cheshire Cafe in Fantasyland and try out their Queen of Hearts Strawberry Shortcake Cake Cup. It was incredibly tasty (also incredibly sweet) and had LOTS of frosting. There are a couple of other cake cup flavors and from what I understand, Disney rotates them every couple months. Usually two flavors are offered at any given time. 3. Fresh Popped Popcorn – I don’t know how, but I swear Disney pumps the smell of fresh popped popcorn throughout the Magic Kingdom. And you know what? It draws me in EVERY SINGLE TIME! I LOVE their popcorn, popped right at the cart. I typically grab a popcorn before we sit down to watch the parade. YUM! Find popcorn carts Castle Hub Area (near the train platform), Storybook Circus, Maurice’s Amazing Popping Machine in Fantasyland, Adventureland and Tomorrowland. Cool tip: If you ask them, the popcorn vendors will give kids their own free little cup of popcorn when you purchase one! 4. Mickey Kitchen Sink Sundae – Folks, this sundae is as wild as it looks! We’re talking EXTREME ice cream (and a hefty price tag at $23 plus tax). Of course, the draw with this treat is that you get the souvenir Mickey sink to take home. There is plenty of ice cream for more than one person to share. Find this massive concoction at the Plaza Ice Cream Parlor on Main Street. Alternate Alert: You can get this same treat at the Beaches and Cream Soda Shop at the Beach Club Resort. Same price BUT it comes with a brownie AND Oreos plus a couple extra toppings! 5. Turkey Legs – Bob and I will both admit, we are not super huge fans of the famous Disney turkey leg. However, many people love them and it’s not every day you get to walk around a theme park chomping on a giant turkey leg. If you like turkey, it’s certainly worth trying at least once. You can find the turkey leg vendor cart in Frontierland. 6. Dole Whips – Need a tasty sweet refreshing treat on even the hottest of days at Disney? You’ll want to cruise by Aloha Isle in Frontierland for a Dole Whip. Dole Whips are a pineapple-flavored soft-serve frozen dessert. 7. 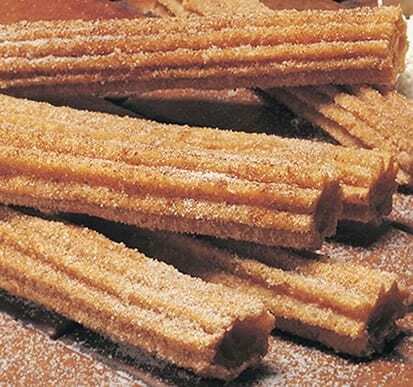 Churros – Have you ever had a churro? They are delicious (long!) bread-like pastries that have been coated in cinnamon and sugar. Served warm, they can be purchased from the Churro cart in Frontierland. 8. Mickey Mouse Soft Pretzels – When I got to grab my popcorn for the parade, Bob always gets a Mickey Mouse soft pretzel or two for himself and the kids. You can find these pretzels at the Churro cart in Frontierland. 9. 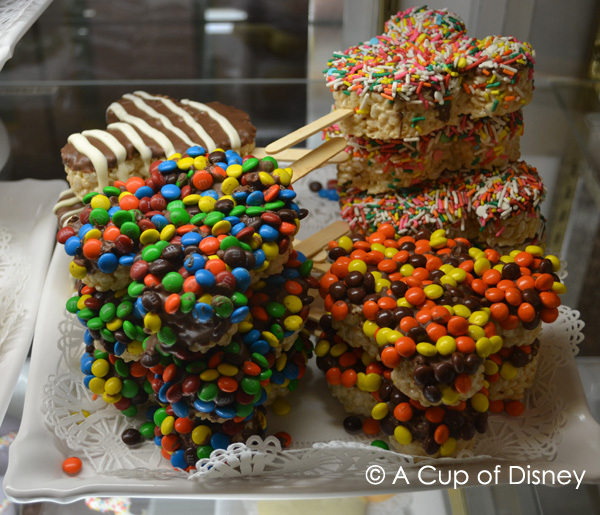 Mickey Mouse Rice Krispie Treats – You will find no shortage of Rice Krispie Treats in the Parks. I have found them in several gift shops and stores, as well as in a couple resort stores. However among my very favorites are the ones sold in the Main Street Confectionery in Magic Kingdom. They are bursting with all sorts of topping choices! 10. Candy Covered Apples – These treats are super delish. They are also huge and have plenty to share. The Main Street Confectionery is a great place to find candy covered apples. They are made fresh and there are a variety of toppings to choose from. We like to buy one and bring it back to the resort with us. There we use a knife to hack it into shareable sized pieces. I’d love to hear what your family’s favorite must-have snacks are in Magic Kingdom! The cake cups are, sadly, a lie. They don’t have them any more. We looked for them eagerly on our last visit (September 2015) and they don’t have them anymore. We had them February 2015. I’ll have to look for them during our next trip – they were so yummy.